There have been several stops on the ranch tour in the history of this blog, but I don't believe I've ever shown you the gym. Could be because it didn't exist until a few weeks ago...when I pulled on a pair of jeans I had purchased in early December and they were already feeling a little too tight. About the same time, I found myself huffing and puffing my way up a cliff that I used to be able to climb without a second thought. Hmmm. Then I stepped on the scale. 'Nuff said. I needed a plan to get back to a healthy weight. 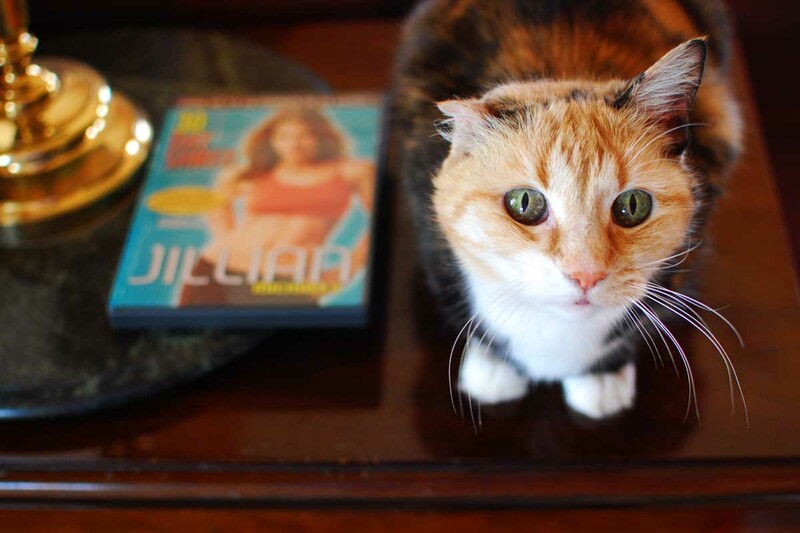 I picked up a copy of Jillian Michael's 30 Day Shred DVD. She promised me I could lose up to 20 pounds in 30 days. Yeah, right. I didn't fall off the turnip truck yesterday. But I figured if I could do her 20-minute workout at least five days a week, ramp up the speed on my daily walks with Smooch, and stop eating like a lumberjack, at least my jeans wouldn't be too tight. 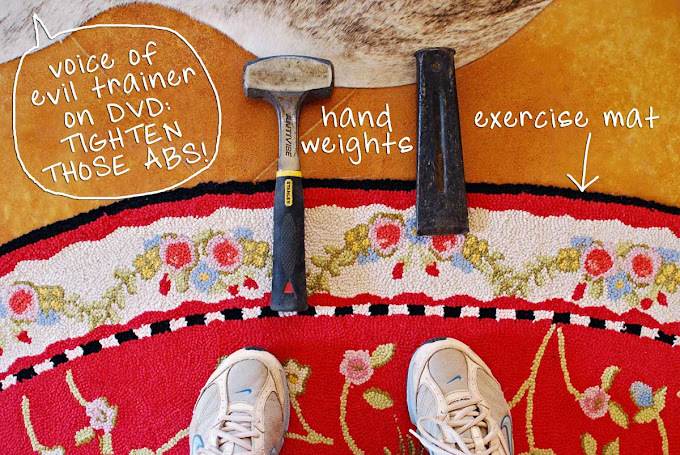 Having failed to read the fine print on the DVD cover that said "you will need hand weights and an exercise mat if exercising on a hard surface," I improvised. As I write this on day 10 of my 30-day shred, much to my surprise, the damned thing's working. My jeans aren't as tight. And I'm sort of enjoying the exercise. Every day, I pull out my makeshift mat and my sledge hammer and wood-splitting thing, turn on the DVD, and make an idiot out of myself in the living room while Smooch and the cats gather around to snicker. I'm quite certain that Hank, George and Alan are watching me through the window and having a good laugh as well. Coach Rosebud: Get off the ground a little higher on those jumping jacks. Me: If you want supper tonight, you'll shut up now. Coach Smooch: You're sweating up a storm over there. Can I get you a towel? Me: Why, yes, you can. And swing by the fridge for a beer as long as you're up. Coach Snapper: Five more...we're almost done. Me: What's with this "we" crap? I wasn't sure I'd have the discipline to stick to this home workout program, but my coaches are keeping me motivated. Then I received a message last Wednesday which is proving to be the greatest weight-loss motivator of all and may change the course of history at the 7MSN. I've set myself a deadline of mid-April and embarked upon a 12-week challenge to get back into riding shape. I'll tell you that part of the story tomorrow. I'm with you on the pants suddenly being too tight and the huffing and puffing to get places that never bothered me before .. TOO much holiday enjoyment!! Even though we have weights and a rowing machine that we use in the basement, it's time to pull the old P90X DVD's back out and dig in. I love your support system ... got a good laugh over that! Way to go Linda! Jillian Michaels will kick that booty that's for sure! Love that you are getting so much help from all your 'friends' around the house. I'm sure you will also cheer them on when they decide to lose weight. Yes? You know, like doing kitty sit ups. I love this post! Your gym equipment (love the "wood splitting thing"), your coaches, and your honest dialog including words like "beer" and "crap" make me laugh AND want to get on the program. WELL DONE! Can't wait to hear about the motivation; sounds to me as if there may be more scooping on the horizon. I bet I can guess what it is that you received. And God bless you for working out. Ahh...can't wait to hear part II. Could there be a new riding horse in your future? Or perhaps a riding trip with some friends? 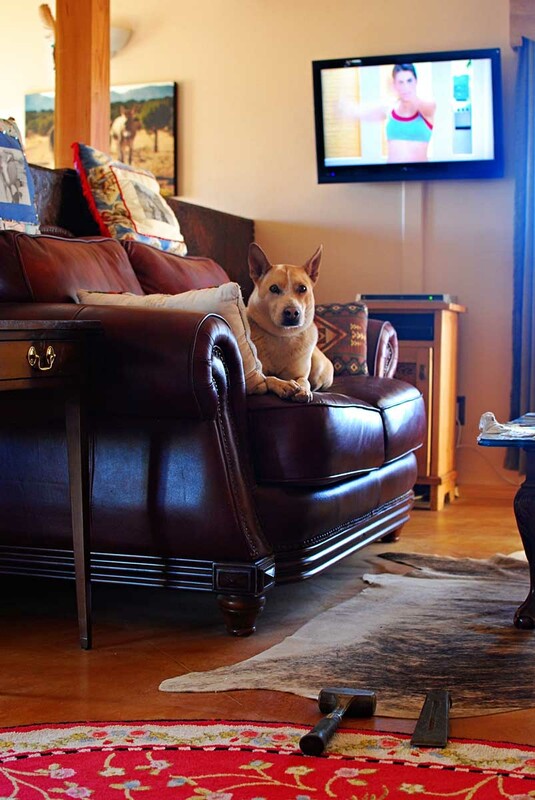 I always had an audience when I embarked on an in home expercise program. Back in the day it was Richard Simmons' tapes. I'd laugh my way through it just looking at the two cats and two dogs watching me. Very serious business, indeed. You really know how to keep us waiting!! I need to get the DVD and join you but you might need to send those coaches over to get me going! OK, this might be some motivation for us all! You have such good coaches though! Sweat on! First I feel your pain. I was riding a bike and could go up a nearby hill without passing out. Now I refuse to get off and walk so I huff and puff. Second I can't wait for the news. You know it is tomorrow somewhere in the world. The riding hint--please tell me it is a horse and not a bike. ROTFLOL That photo of Rosebud is priceless!!!!!! 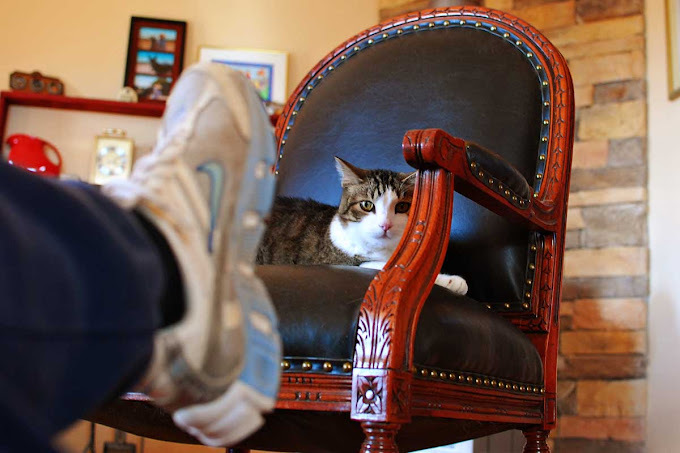 That is a fabulous leather chair that your cat owns! I can't wait to hear the rest of the story....and the mental image of you jumping around with the hammer and wedge makes me think that some of the looks you captured from the coaches couches are more in fear for their lives than something else! Because I think your blog is truly stylish, I have passed on the "Stylish Blogger" Award to you. 4. Contact these bloggers and tell them about the award! Thanks for being such a great blogger and for enriching my life! What a great support system you have there! Good luck with the new routine. Can't wait for the news! At least your 'coaches' just sit and watch. Mine get (I should say got ~ it's been years since I've done any kind of regular exercise) on the floor with me and rub up against me ~ tails in my face or rolling up against me and pawing and barking at me. They can make it quite difficult to keep count! Perhaps I found your blog for a reason today. May I join you in your daily regime? Congrats on the workout program success, even with the many coaches staring you down. Can't wait to hear riding news. I'm on doctor ordered exercise/diet regimen myself. So far increasing speed on treadmill to get more bang for the thirty minutes. Not exactly Jillian intensity, but working nevertheless. Good for you Carson! I, too, am feeling the tight jeans. I am back to using Leslie Sansone's Walking at Home DVDs. Certain joint issues prevent me from doing some exercise. I can wait to read the next episode about "riding". I love all your coaches watching you. Riding shape? that sounds exciting!! Cute post! Can't wait to hear "the rest of the story!" Without your personal trainers and coaches, I'm sure you wouldn't have stuck to the exercises. I love the way they're laying around telling you how to do it right. I'm hoping that you've finally decided to get Hank a new equine friend and that you can ride again soon. Very exciting. Keep pumping and jumping. I'm in no condition for a cliffhanger!!! Love your home gym and your creativity! I love, love, love JM's 30 day shred. It works. I cuss at her the whole time and tell her how evil she is, but once I see results, she becomes my idol :D Good luck and keep up the good work! I'm back on the treadmill... doing some boinging around in my exercise room.... yes,.I even have one of those.... but, have no buddies to laugh at me. Or give advice...but...I too enjoy doing my routines.... and I aim to be ready to march around 18 holes every other day or so...right out of the chute...when spring arrives. Which...around here...well, you never know just when it will be...but, I ain't planning on being out in snow drifts...so..probably May....... and my jeans are fitting much better already too.. I'm having cake this last few days...so...must jump a bit higher for a few more jumping jacks too.... hahhah... send Rosebud for a visit....does she like salmon? Looking forward to hear about your new motivator!! Your indoor family looks a bit astonished about whats going on. Lovely photos! Ohhhhh....I love your support system! I have one here...3 dogs and 2 cats and a blue jay! I realize I'm late responding to this post and I'm really glad you're motivated, but Carson - you know what the problem was, don't you? It's that damn bread recipe you posted a while back. My & my other half have gained 20 pounds since I started baking it.. I have a whole cabinet full of work out videos. If I could just sit here and watch them work out, it would be fine, but the videos only seem to work if I actually do the exercises. That should also be in the disclaimer. Trying to start back up with my P90X with Tony Horton...and do things that don't include the injured left knee. Now that's hard...they kinda figure you have the whole body to work with!